With our world renowned tailored clothing partners we provide semi-custom, custom and made to measure clothing. Choose from hundreds of fabrics from the world’s finest mills including Ermenegildo Zegna, Vitale Barberis Canonico and Loro Piana. Design your own garments with custom details like side vents, ticket pockets, pick stitching and other special features. Most garments delivered within 4-6 weeks at surprisingly affordable prices. Proudly made in USA: Southwick, Gitman Bros. and Jack Victor (Canada). Your inquiries and special requests are welcome. Please call (502) 423-6700. Whether you’re seeking minor alterations or full custom tailoring, The Fashion Post can serve your needs. Every item purchased at The Fashion Post includes professional alterations for the life of the garment – never a charge! 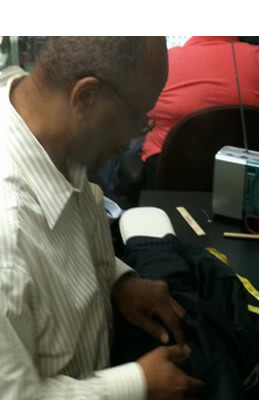 All work is performed on premise by our in-house tailoring staff – with more than 135 years experience. For a nominal fee, we gladly accept garments purchased elsewhere. They will receive the same meticulous attention as those purchased from us.